The breed standard of the Siamese indicates an elegant, slim, flexible, and well-muscled body. Its head is triangular shaped, with a thin snout. The eyes are almond-shaped and oblique, with large wide based ears positioned more towards the side of the head. The positioning should form a triangle from the tip of the nose to the tips of the ears. It has a long neck, body, and whippy tail. The fur is short, glossy, fine and soft. The Siamese is characterized by its typical point colours. The points are the tips of the ears, tail and nose. 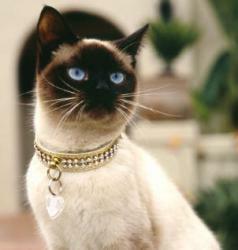 Siamese are usually very affectionate and intelligent cats, renowned for their social nature. Many enjoy being with people and are sometimes described as “extroverts” Often they bond strongly to a single person. Some Siamese are extremely vocal, with a loud, low-pitched voice. They are active and playful, even as adults.